Why should I use Insurance Direct for my insurance? Why do I Need a DL-123? Why do I Need an FS1? I was just in an accident-what do i do now? 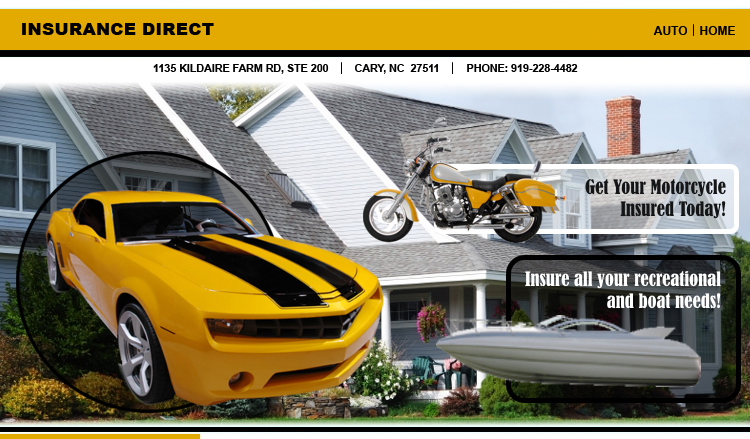 Insurance Direct is a independant Insurance Agency and brokerage which simply means I work for YOU not the insurance company. I have a variety of standard and non-standard carriers to choose from to find you the best premium for the best coverage. Captive carriers only have one company, one choice. Choice is a good thing. When you apply for your NC drivers license or to reinstate your drivers license, the DMV requires this form as proof that you have auto liability coverage, either in your name or as a driver on someone else's policy. Ask your insurance agent to type up one of these forms for you. They are good for 30 days at a time. The North Carolina DMV will mail you a letter after you've had a lapse in auto insurance asking you to "re-certify" that you had coverage on the date(s) in question. Ask your insurance agent send an FS1 to the DMV to prove that you had coverage on the date they say you had a lapse, or to show what date your auto insurance was reinstated. If you indeed had a lapse of coverage, you will need to pay a $50 fine to the state (more if you've had multiple lapses in a few years) and they may suspend your license plates for 30-60 days. If you had a reason why you allowed your auto insurance to lapse, ask for a hearing and you will be able to plead your case over the phone. North Carolina is not a "No-Fault" state so if the accident was not your fault, contact the other party's insurance company to report a claim. If the accident was your fault, contact your own insurance company. A claim file will be set up within 24 hours. If you are injured in any way or your passengers may be, immediately see your doctor. The doctor bill will be paid by either your medical coverage or uninsured motorist, or the at-fault party's liability, subject to limits on the policy(s). Feel free to contact your own agent with any questions about the claim-they are your advocate.